We have three acres of mixed vegetables, fruit, and flowers. We use organic growing methods but are not certified. 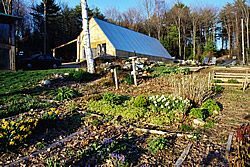 We sell our produce at the Bernardston Farmers’ Market, Saturdays 10-1pm, the Northfield Farmers’ Market, Thursdays 4-7pm, at Green Fields Market and we have a small CSA. The Coyote Hill Farm CSA runs from June through October. These shares include seasonal mixed veggies, fruit and flowers every week for $20. All produce is grown with organic methods. This CSA has two pickup days: Sunday and Tuesday any time between noon and 6pm.